I've been called a "state traitor" for this, but I just don't care, it's just a far superior state than all others. It's fact. 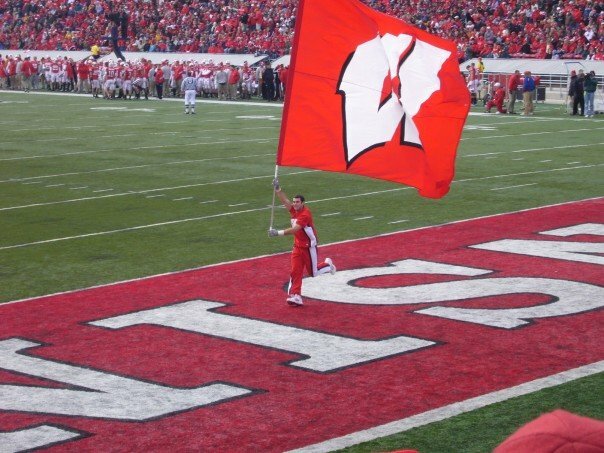 In honor of the Rose Bowl and all things Wisconsin, this story come from 2005. It's Wisconsin football at Camp Randall. This was my sophomore year of college and this was a day for excitement. It was Saturday. It was a home football Saturday. It was a night game (a rarity). And Michigan was the opponent. The evening forecast called for rain and being resourceful college students my friends and I made gratis ponchos. This means "borrowing" extra large trash bags from the janitor's closet and punching a hole in them for your head. We then decorated them with markers. 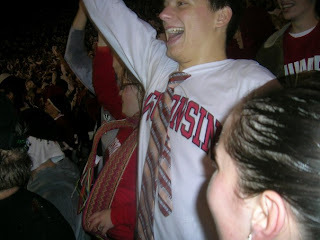 Obviously, no one in Madison was cooler than my friends and I (have I mentioned that I wore a clip-on tie to every home game for 3 years?). The game was spectacular. Hard fought. Loud. Brian Cal-hoooun. Evenly matched. Late in the 4th quarter, down 4, the Badgers get the ball back on their own 48. We need a touchdown, a field goal is not enough, there's not enough time for two scores. Touchdown or nothing. 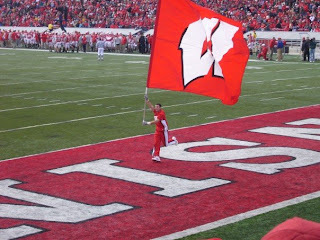 Wisconsin is lead by our running back Brian Calhoun, who is solid, and quarterback John Stocco, slow as molasses, mistake prone, and rather inexperienced. On the previous possession Stocco had thrown an interception and the tension was palpable as the Badger offense took the field. 10 plays later Wisconsin had moved 48 yards and found ourselves on the Michigan 4 yard line with under 30 seconds to play. I had long since shed my garbage bag poncho and given in to the rain. It all comes down to this. The following sequence can all still be replayed in slow motion in my mind. Stocco lines up under center, takes the snap, and drops back to pass. In my mind, I gasp. I still lacked confidence in our QB. But then something happens where I certainly gasped and possibly yelled out, "Noooo!" Stocco pulls the ball down and runs for the endzone. It's a draw play and Stocco is running with the football. Stocco puts his head down and runs with no abandon (still slow though).
. . . somehow almost untouched, Stocco runs, one, two, three big steps, he leans and spins into the end zone and Stocco is mobbed by his teammates. I end up two sections over hugging people I've never met. We're all wet. We're all amazed. We're all happy. Wisconsin remains the best state in the nation. AGREED. I always thought Stocco was underrated.